Have you ever gotten stuck on the side of the road with a flat tyre? Do you want to be able to change a tyre without having to ask for help? Fortunately, changing a tyre is a pretty simple task, provided you’re prepared and willing to exert a little effort. 1. 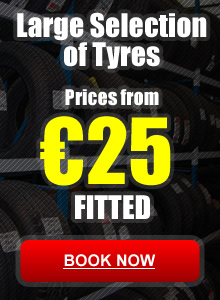 Find a flat, stable and safe place to change your tyre. You need a solid, level surface that will restrict the car from rolling. If you are near a road, park as far from traffic as possible and turn on your emergency flashers (hazard lights). Avoid soft ground and hills. 2. Apply the parking brake and put car into “Park” position. 4. Take out the spare tyre and the jack. Place the jack under the frame near the tyre that you are going to change. Ensure that the jack is in contact with the metal portion of your car’s frame. 6. Remove the hub cap and loosen the nuts by turning counterclockwise. Don’t take them all the way off and just break the resistance. Having the wheel on the ground means that you’re turning the nuts instead of the wheel. 7. Pump or crank the jack to lift the tyre off the ground. You need to lift it high enough to remove the flat tyre and replace it with a spare. 9. Remove the tyre. Place the flat tyre under the vehicle so in the event of a jack failure the vehicle will fall on the old wheel, hopefully preventing injury. If the jack is placed on a flat, solid base, you shouldn’t have any problems. 10. Place the spare tyre on the hub. Take care to align the rim of the spare tyre with the wheel bolts, then put on the lug nuts. 12. Lower the car without applying full weight on the tyre. Tighten the nuts as much as possible. 14. Put the old tyre in your booth and take it to a us.